Light dry white wines, rosés, sparkling wines: Serve at 5–10°C to preserve their freshness and fruitiness. Think about a crisp Pinot Grigio and Champagne. For sparklers, chilling keeps bubbles fine rather than frothy. This is also a good range for white dessert wines. Sweetness is accentuated at warmer temperatures, so chilling them preserves their balance without quashing their vibrant aromas. Full-bodied white wines and light, fruity reds: Serve at 10–16°C to pick up more of the complexity and aromatics of a rich Chardonnay or to make a fruity Beaujolais more refreshing. Full-bodied red wines and ports: Serve at 16–18°C, cooler than most room temperatures and warmer than ideal cellaring temperatures to make the tannins in powerful Cabernet or Syrah feel more supple and de-emphasise bitter components. If your wines have been sitting out at room temperature, it can take an hour or two in a fridge to chill a white or bubbly down to the right temperature, and there is no harm in sticking a too-warm red in there for a little while too. On the other hand, a red pulled from a cellar, cooler or fridge may need up to a half-hour sitting out at room temperature. If you can afford it, it is handy to have a small wine cooler with temperature settings up to 18°C; you can use that to hold bottles you want to open for dinner or a party. 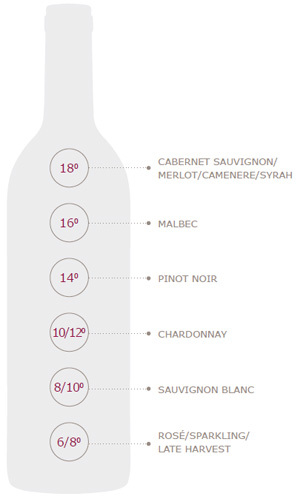 Barring that, how do you know if the wine has reached serving temperature? Instant digital thermometers can take a wine’s temperature through the bottle, and there are other models you can stick in the mouth of an open bottle. But it is easy enough to touch the bottle and guess; it should at least be cool to the touch. After enough trial and error from opening and tasting, you will learn what feels ‘right’. Keep in mind that a wine served cool will warm up in the glass, while a wine served warm will only get warmer. It is always better to start out a little lower than the target temperature.